The loops should be across the road and the wind should be perpendicular to the loops. Each time the reference is crossed, the crossing angle should be the same, and the wings of the airplane should be level. The eights may also be performed by rolling from one bank immediately to the other, directly over the reference. The pattern involves flying downwind between the pylons and upwind outside of the pylons. It may include a short period of straight-and-level flight while proceeding diagonally from one pylon to the other. The pylons should be on a line perpendicular to the wind. The maneuver should be started with the airplane on a downwind heading when passing equally between the pylons. The distance between the pylons and the wind velocity determines the initial angle of bank required to maintain a constant turn radius from the pylons during each turn. 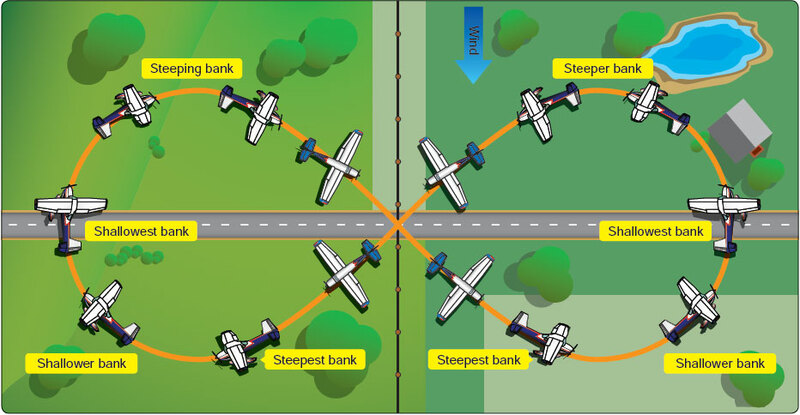 The steepest banks are necessary just after each turn entry and just before the rollout from each turn where the airplane is headed downwind and the groundspeed is highest; the shallowest banks are when the airplane is headed directly upwind and the groundspeed is lowest. As in other ground reference maneuvers, the rate at which the bank angle must change depends on the wind velocity. If the airplane proceeds diagonally from one turn to the other, the rollout from each turn must be completed on the proper heading with sufficient wind correction angle to ensure that after brief straight-and-level flight, the airplane arrives at the point where a turn of the same radius can be made around the other pylon. The straight-and-level flight segments must be tangent to both circular patterns. The eights-on-pylons is the most advanced and difficult of the ground reference maneuvers. Because of the techniques involved, the eights-on-pylons are unmatched for developing intuitive control of the airplane. Similar to eights around pylons except altitude is varied to maintain a specific visual reference to the pivot points. The visual reference line, while not necessarily on the wingtip itself, may be positioned in relation to the wingtip (ahead, behind, above, or below), and differs for each pilot and from each seat in the airplane. This is especially true in tandem (fore and aft) seat airplanes. In side-by-side type airplanes, there is very little variation in the visual reference lines for different persons, if those persons are seated with their eyes at approximately the same level. Therefore, in the correct performance of eights-on-pylons, as in other maneuvers requiring a lateral reference, the pilot should use a visual reference line that, from eye level, parallels the lateral axis of the airplane. The altitude that is appropriate for eights-on-pylons is called the “pivotal altitude” and is determined by the airplane’s groundspeed. In previous ground-track maneuvers, the airplane flies a prescribed path over the ground and the pilot attempts to maintain the track by correcting for the wind. With eights-on-pylons, the pilot maintains lateral orientation to a specific spot on the ground. This develops the pilot’s ability to maneuver the airplane accurately while dividing attention between the flightpath and the selected pylons on the ground. An explanation of the pivotal altitude is also essential. First, a good rule of thumb for estimating the pivotal altitude is to square the groundspeed, then divide by 15 (if the groundspeed is in miles per hour) or divide by 11.3 (if the groundspeed is in knots), and then add the mean sea level (MSL) altitude of the ground reference. 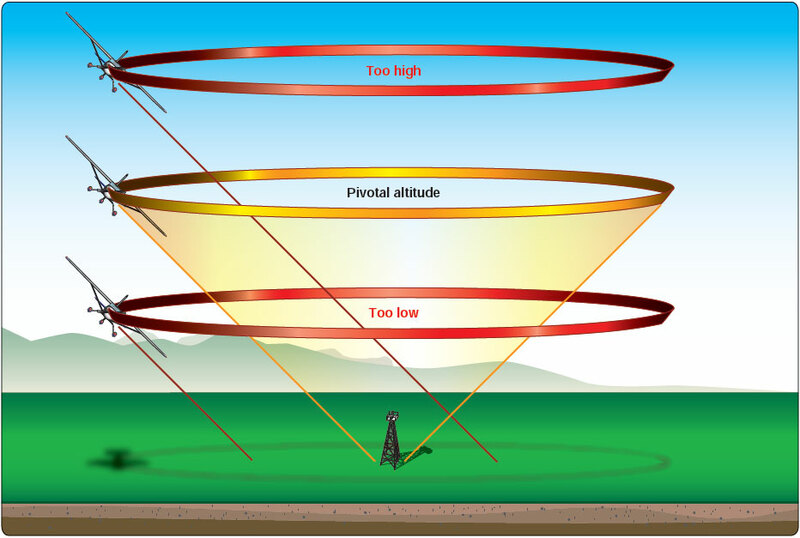 The pivotal altitude is the altitude at which, for a given groundspeed, the projection of the visual reference line to the pylon appears to pivot. 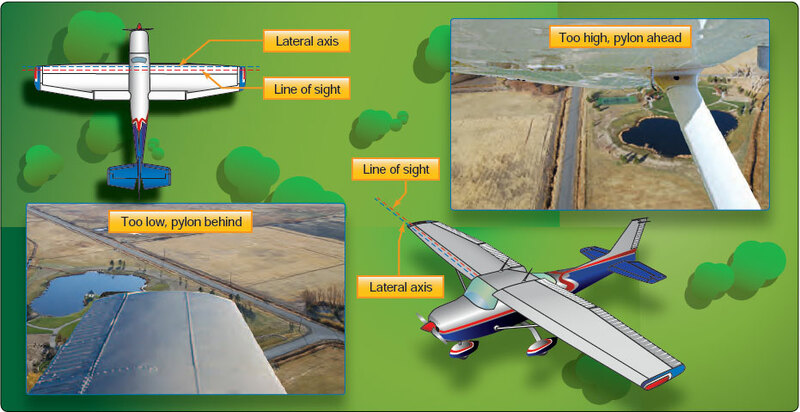 [Figure 6-12] The pivotal altitude does not vary with the angle of bank unless the bank is steep enough to affect the groundspeed. Figure 6-12. 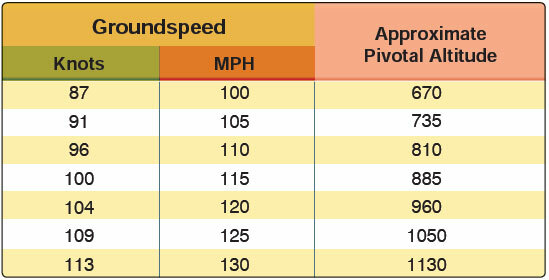 Speed versus pivotal altitude. Distance from the pylon affects the angle of bank. At any altitude above that pivotal altitude, the projected reference line appears to move rearward in a circular path in relation to the pylon. Conversely, when the airplane is below the pivotal altitude, the projected reference line appears to move forward in a circular path. 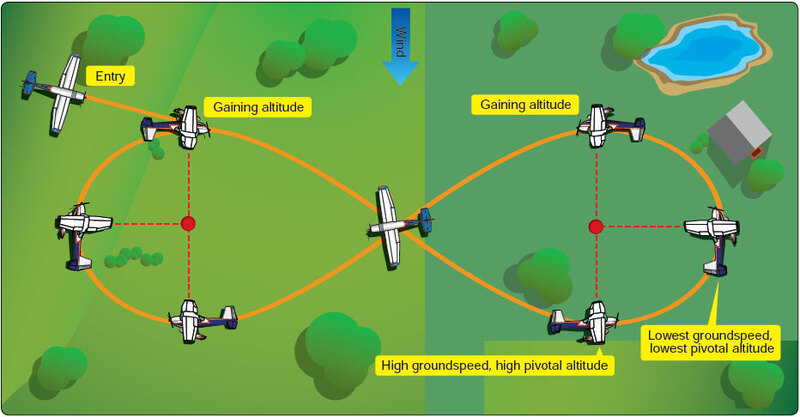 [Figure 6-13] To demonstrate this, the pilot will fly at maneuvering speed and at an altitude below the pivotal altitude, and then placed in a medium-banked turn. The projected visual reference line appears to move forward along the ground (pylon moves back) as the airplane turns. The pilot then executes a climb to an altitude well above the pivotal altitude. 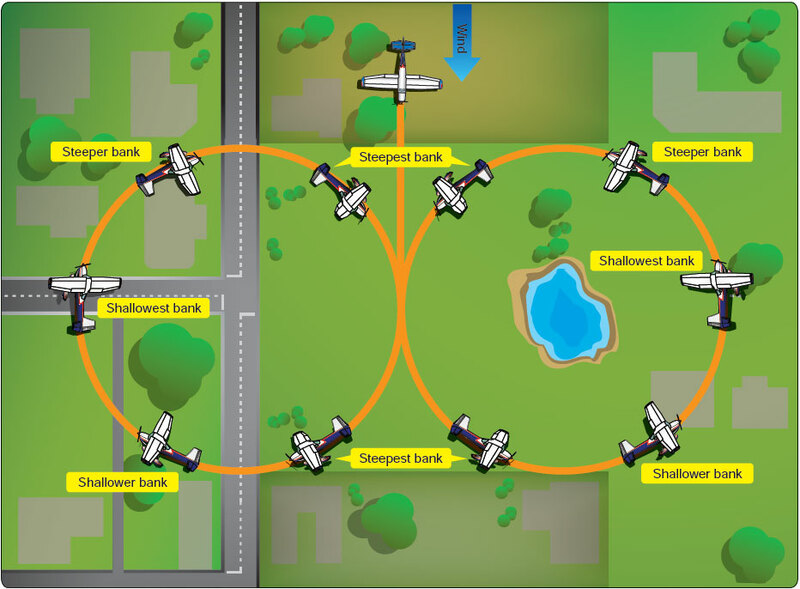 When the airplane is again at maneuvering speed, it is placed in a medium-banked turn. At the higher altitude, the projected visual reference line appears to move backward across the ground (pylon moves forward).